Convey your heartfelt feelings of love and affection to your loved ones with this beautiful arrangement of flowers. 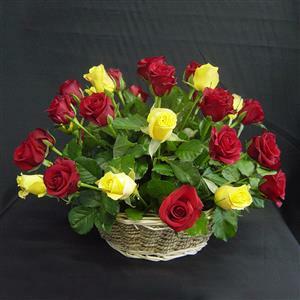 There are 24 red and 24 yellow roses adorned in a round shaped Cane basket. The basket comes with a handle which makes it easy to carry. The fillers and the greens add to the beauty of the basket. Send this flower basket to India to your loved ones along with other Gifts to India through RGCards.com and make the moments special forever.